"Long live the beautiful East!...Long live nationality! Long live the style of rayonist painting that we created - free from concrete forms, existing and developing according to painterly laws." Considered the pinnacle of avant-garde art by the founders Mikhail Larionov and Natalia Goncharova, Rayonism (sometimes translated from Russian as Rayism) developed new ways to express energy and movement. From its conception as a subset of Russian Futurism, Rayonism drew from scientific discoveries and the theoretical conceptions of the fourth dimension. The movement was very self-consciously modern, even as it incorporated elements of traditional folk culture. It was also fiercely nationalistic, projecting itself as a distinctly Russian style, despite its obvious inspiration from European movements including Cubism, Orphism, German Expressionism, and Futurism. Influenced by both close connections to an international avant-garde and native traditions of Russian art and craft, Rayonism captures the contradictions of Russian culture in the pre-Revolutionary era. It was presented as an unapologetic combination of cosmopolitan and nationalistic impulses, sometimes referred to as Everythingism. This encyclopedic approach to style and subject was considered the essence of the modern pace of life. The style and subjects of Rayonism reflected contemporary scientific and metaphysical developments. The adoption of transparency and fractured objects was influenced by changing understandings of the material world through the discovery of x-rays and radioactivity. The world no longer could be thought of as purely solid and concrete. This, in turn, reinforced fourth-dimensional theories of space and experience as a continuum of our observable universe. By focusing on light as subject matter, the artists could dissolve objects into their surrounding space; these layers of transparency were thought to be representative of the fourth dimension. The Rayonist interest in popular culture and materiality (known as faktura) broke with the expectations of fine art. Believing that their work spoke to larger questions of existence and spirituality, the Rayonists aspired to break down the boundaries between art and life. This would be mirrored in the work of the later Suprematist and Constructivist artists, who embraced faktura as a means of constructing spiritually-charged spaces in the post-Revolutionary years. The brainchild of life-long partners Mikhail Larionov and Natalia Goncharova, Rayonism synthesized elements of Russian avant-garde painting to create a deliberately modern style. As Russian Futurists associated with the Knave of Diamonds (also known as the Jack of Diamonds) group, they had experimented with Neo-primitivism, which recovered traditional motifs in a style that tried to replicate the naïveté of folk art, along with Russian Cubo-Futurism, which blended Cubist distortion with depictions of movement. In 1912, when Larionov and Goncharova broke with the Knave of Diamonds group to stage The Donkey's Tail exhibition, they rejected the notion of stylistic unity and included a broad range of work. This pluralism would remain part of Rayonism, even as the artists began to define general themes of the style. In part, scientific writings on the discovery of radioactive rays and x-rays were instrumental to their depictions of dynamic time and space (Larionov had most likely read Marie Curie's Radioactivity and The Discovery of Radium, both recently published in Russia). This painting is one of a series on peacocks, where Goncharova combines elements of the primitive styles of Egyptian and Russian folk art with Rayonist abstraction. The result reflects the juxtapositions and contradictions common to the style, as she freely mixed ancient and modern influences. Showing the peacock's head and neck in profile, she borrows the composite pose (common in Egyptian art), which allowed for the greatest amount of information to be described in simple contours. Likewise, the tail is spread out in a frontal view, to highlight the defining characteristic of the subject. The blocks of brilliant color suggest Russian folk painting and decorative arts. Their non-descriptive, unrealistic hues transform the recognizable shape of the peacock's plumage into an abstract array of color. The literary concept of Zaum poetry, comprised of nonsensical sounds that assaulted traditional language structures, was embraced by the Russian avant-garde as a means of breaking with the past. Like the Italian Futurists, who were contemporaneously adopting similar approaches in their poetry, the intent was to create a wholly modern, sensorial alternative. Alliances with sympathetic visual artists, such as this collaboration between Kruchenykh, a radical Russian Futuristic poet, and Larionov, were common. In this work of Realistic Rayonism, the artist depicts a dynamic rooster in rays of red and gold; a hen, barely identifiable, appears in golden planes of color beside it. While the objects of the painting are discernable, the true subject, however, is their merging with the background space and their disillusion into rays of light and vectors of energy. This is particularly evident in the left half of the painting, as the lines of reflected light intersect in a chaos of dynamic force lines. It is possible, but quite difficult to locate the two bottles, five tumblers, and goblet on a table in this painting, as the objects have been rendered in layers of transparency and broken up by intersecting rays of light. In this transitional work, between Realistic Rayonism and Pneumo-Rayonism, remnants of the objective world are simply points of departure for the light rays. Even the title veers toward abstraction, as it refers to glass as a substance, rather than as the objects made from it; while focusing the viewer on the materiality of the objects and the transparencies of their depiction. One well-informed review of 1913 wrote that the painting depicted, "simply 'glass' as a universal condition of glass with all its manifestations and properties." In this work of Pneumo-rayonism, any reference to the external world has vanished in intersecting dynamic light rays and colored planes. The space becomes tangible, a palpable shape. Indeed, an energetic but indefinable form, full of depth, layers, and movement seems to inhabit the canvas. Space and energy are the subject of the painting. Demonstrating the stylistic fluidity of Everythingism, this painting features the Cubo-Futurist depiction of Neo-primitivist objects; only the transparency of the still life explicitly marks the painting as Rayonist. A table overflowing with fruit - pears, apricots, plums, grapes, oranges, lemons, and watermelon - appears along with plates, a crystal bowl, and, at the top right, a white napkin with a traditional lubki image of a man riding a blue horse. Everything is rendered transparent; the pits can be seen inside the apricots, and, through the translucent watermelon, the plate on which it rests is visible as is the detail of its floral pattern. This intermingling of layers unifies the objects, even as they are dissected by this x-ray vision. There is an almost postmodern element of self-referentiality and metarepresentation in this painting, which plays with the notions of figuration and abstraction (Realistic and Pneumo-Rayonism) by depicting an abstract painting as the subject of the canvas. 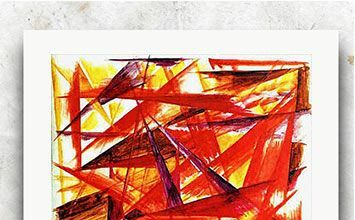 Set in the center of the work is a discrete second painting, a Rayonist composition of superimposed Russian words, light rays and planes of color that form long extended triangles, pointing downward. In this painting, the Rayonist rays of blue, green, black, and white work on a representational and abstract level: they suggest the dense, dark foliage of the titular forest, while also evoking an energetic and overwhelming sense of life and movement. Goncharova painted multiple Rayonist works focused on this subject, perhaps drawing upon Ouspensky's belief that the forest, animistic and unified, exemplified what he called the "life-activity" of the fourth dimension. It was a space that was comprised of infinite individual units, bound together into one living biome. Goncharova takes this notion and adds to it the splintering vectors of Pneumo-rayonism, although there remains a suggestion of a woman's face on the left, and, at the bottom of the canvas, a large dragonfly. A prime example of Pneumo-rayonist abstraction, this non-objective painting also points toward the legacy of Rayonism in post-WWI, post-Revolutionary Russia. Larionov has created a formal composition of nothing more concrete than intersecting light rays, textured planes, and fragments of text. The work communicates to the viewer solely through the emotions evoked through color and line, as suggested by the equally abstract title.